This sovereign purse is one of several purse patterns, including a Bridal Beaded Purse which were first published in Beeton’s Book of Needlework, 1870. Small knitted, netted or crocheted silk or cotton coin purses are also characteristic of [the Victorian] period and were known as stocking purses, or ‘miser’ purses. By mid century these had metal fastenings and the whole was often made of a delicate metal chain, which supported sovereigns and half sovereigns, hence the term ‘sovereign purse’. Chamois leather was also used, together with metal rings to secure the coins. Sovereign cases were of circular metal design, with an internal spring to release a coin at a time. It is worth noting that in North America handbags are still called purses, which may refer back to their introduction there from Europe after 1800, when they were still primarily coin purses. You can search the museum’s extensive gallery of antique bags and purses, which is a great tool if you’re trying to date or research a vintage purse. The patterns in Beeton’s Book of Needlework often refer to numbered art plates which illustrate a particular stitch or detailed piece of the work. In this extract, we have included the plate of the purse , plus smaller versions of plates 209 and 210, which are referenced in Beeton’s original pattern. No. 209 shows the pattern of the point Russe stitch nearly full size. 1 skein of black purse silk: 1 skein of coloured ditto; a few steel beads; and a steel clasp. 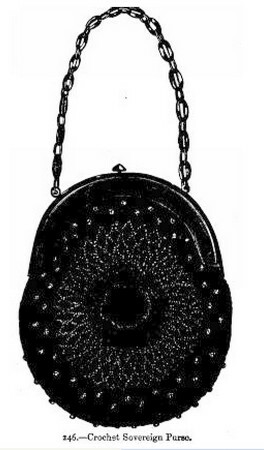 The open portion of this purse is worked in coloured, and the raised rose and outer border in black, silk, the latter being dotted with steel beads. A few rows of plain double crochet are worked, increasing where necessary, to make the work lie flat; then 4 rows of loops of chain in coloured silk, and then 3 rows of thick double crochet, threading the beads first on the silk, and pushing them up to the stitches when required. The black silk must now be joined on to the centre, and the little  raised piece worked in treble crochet, inserting the hook on the upper side of the stitches. Three rounds of treble are executed, and when both sides of the purse are finished they should be joined together (except where the clasp is put on) by a row of open treble, ornamented with beads. This purse is so easy to make, that it might be worked without the least difficulty from the illustration. Materials: Coloured filoselle, cloth, velvet, The middle oval of [the] medallion contrasts with the colour of the ground, and must therefore be worked in applique on the latter with herring-bone stitch, before working the outer border. are usually available through Amazon. You can also view or download the entire book for free from Project Gutenberg, but the download is large.